The following complaint has been profferred as a model for anyone else who wishes to complain. It was drafted by someone who used to work for the Advertising Standards Authority and the ITV internal regulator. Feel free to use it in your responses to Ofcom and Channel 4, and forward it to anyone else who was outraged that Channel 4 aired the programme with no caveats. A copy of the Broadcasting Code items apparently breached appears at the foot. I am making a formal complaint about the Channel 4 documentary The Great Global Warming Swindle. This programme is grossly irresponsible in misleading Channel 4’s viewers about the impact of climate change and the need for action. In doing so I believe it breached the Broadcasting Code clauses: 5.5, 5.6, 5.7, 5.8, 5.9, 5.10, 5.11 and 5.12. The programme maker and all the sources used are well known for their lobbying against climate science. Indeed the presenter Michael Durkin has a previous ruling against him for a similar breech of the Code with Channel 4’s ‘Against Nature’. It is clear therefore that this team requires stricter regulation and I urge you to require pre-clearance for any further programming from this source. Breach of clause 5.5: Man made climate change is clearly a matter of industrial, political and public policy controversy. The Great Global Warming Swindle failed to show due impartiality towards the science of climate change and failed to represent opposing views. Breach of clause 5.6: Channel 4 made no indication of The Great Global Warming Swindle being part of a linked series of programmes and it is not part of any series that a viewer can identify. Breach of clause 5.7: The Great Global Warming Swindle repeatedly expressed views as if they were facts. Breach of clause 5.8: The professional and career track record of Michael Durkin where at no point explained to viewers nor was he introduced nor did Channel 4 add a caveat at the end of the programme. Breach of clause 5.9: The programme comprised personal views (presented in the guise of facts) and no balancing views were included. Breach of clause 5.10: The personal views in The Great Global Warming Swindle were not signalled as such. Breach of clause 5.11: Climate change is clearly a matter “of national, and international, importance” and Channel 4 should be heavily censured for failing to apply the Code in this context. I am not a person who leaps to censorship or to stifle genuine scientific debate. But this programme falls far short of that, being merely the last gasp of lobbying by the US petroleum industry. Channel 4 has a track record of breaching Ofcom Codes and I urge you to exact the most severe punishment available to you for what I can without exaggeration call ‘a crime against humanity’. 5.6 The broadcast of editorially linked programmes dealing with the same subject matter (as part of a “series” in which the broadcaster aims to achieve due impartiality) should normally be made clear to the audience on air. 5.9 Presenters and reporters (with the exception of news presenters and reporters in news programmes), presenters of “personal view” or “authored” programmes or items, and chairs of discussion programmes may express their own views on matters of political or industrial controversy or matters relating to current public policy. However alternative viewpoints must be adequately represented either in the programme, or in a series of programmes taken as a whole. Additionally, presenters must not use the advantage of regular appearances to promote their views in a way that compromises the requirement for due impartiality. Presenter phone-ins must encourage and must not exclude alternative views. Programmes included in any service taken as a whole, means all programming on a service dealing with the same or related issues within an appropriate period. Text, tables and figures given here are final but subject to copy-editing. Hands up! How many of you have read page 1? In fact, IIRC, the initial release had pretty much the same text about being subject to copy-editing, but with the issue date of 2 Feb. Given such warnings on the front of that document, one should expect there to be typographical and transcription errors, particularly considering the amount of redrafting the final agreed text had to go through to meet the requirements of all interested parties by the self-imposed press deadline. There are over 50 drafting and draft contributing authors listed on the cover of the 4th SPM, each, no doubt, having editorial input and with varying degrees, also no doubt, in English language abilities. Added to that will undoubtedly be the slew of subeditors making their contributions. Errors are to be expected. The 4th SPM is not peer-reviewed work; it is a distillation of published peer-reviewed work these last 4 years or so that will make up AR4. For anyone even to try to seek to compare the IPCC’s 4th SPM transcription/copy-editing errors with possible (and definite) errors in method in peer-reviewed publications (and I’m not saying you are) is ludicrous. Of course, if there are errors perpetuated from the original peer-reviewed work from which AR4 will be drawn and from which this 4th SPM was put together, then it is for the authors of those studies to issue errata, corrigenda, retractions, etc., in the journals in which their work was originally published. That would be a matter for them, not the IPCC. The IPCC would then, no doubt, respond. Errors are a fact of life: confess/retract/amend and move on; don’t retreat and hope people forget and then use your results as scientific fact. So, yes (at least in my mind), the IPCC have been about as upfront as possible with regard to acknowledging copy-editing errors in their document for policymakers. I can’t think of anything more prominent than putting that disclaimer and the date of amendment on the front page of the report. But all this is to divert attention from that scandalous piece of TV on C4. RE “Temperature leads CO2 by 800 years in the ice cores,” I don’t think they are claiming no correlation, but rather that if A causes B, then B cannot cause A. That’s very faulty logic. I use this example in class: Which causes which — re education and income? And students answer that better education leads in general to higher income. Then I pose this situation: What if parents have higher incomes, won’t their children be able to get better educations, in general? As for GHGs following temperature rises, that is just what I’ve been bleeping about many times: surely we are headed for a spiralling out of human control situation, if we do not reduce drastically. The initial warming, caused by our GHGs, could trigger nature to emit GHGs, causing further warming, causing further emissions, causing further warming. This is indeed a much more serious situation that simply GHGs causing warming (and no positive feedbacks involving GHGs) — which implies that we can more leisurely consider whether or not to reduce, and just how little to reduce, and, afterall, it’s sorta nice not to have to shovel snow. We are on a runaway train, shovelling coal as fast as we can, headed for a big cliff. There will be a point, beyond which even if we reduce our GHG emissions to zero, the train will not be able to stop in time and it’s over the cliff for many of us & much of earth’s biota. And they’re talking about being swindled out of what? Couldn’t be money, because measures to reduce GHGs save money. Couldn’t be freedom, because once you’re off the grid, you’re a lot freer than the matrix guys plugged into the grid. So what are we swindled out of??? But just for the sake of argument, supposing we do have to pony up some money at some point, after we’ve reduce our GHGs by 3/4ths and technology has not come up with any more new conservation/efficiency or alternature measures. What’s a few bucks, compared to losing lives — that’s the cost of not mitigating AGW, when it is indeed happening. The arrogance of thinking that puny man is changing global climate is only exceeded by the stupidity of believing we can – and must – urgently do something to stop it. Colin is right (comment #47). We need impartial reports by scientists not scare stories. Unfortunately impartial reports don’t sell as well as scare stories, and don’t produce funding for more research (and more scare stories). It’s really all about money, and that’s what makes the world go around. Gavin, I don’t understand your answer. The CCSP report you mention does indicate a divergence between models runs and satellite / radiosonde date over Tropics, as Al Bedo suggests it. So, this issue is open, as it is concluded. – Although the majority of observational data sets show more warming at the surface than in the troposphere, some observational data sets show the opposite behavior. Almost all model simulations show more warming in the troposphere than at the surface. This difference between models and observations may arise from errors that are common to all models, from errors in the observational data sets, or from a combination of these factors. The second explanation is favored, but the issue is still open. I would also be interested to know if models and satellites/sondes converge on Antarctica, more broadly 60°S and poleward. Any information about that ? RSS or UAH database suggest a cooling trend 1979-2006 in lower troposphere, but most AR4 ensemble models runs indicate a sustained surface warming for this zone, already significative for the runs 2010-30, as well as of course for the rest of the century. Some say ozone play a particular role, but I don’t perceive why it should lead here to a cooling trend in lower layers of the atmosphere. > I can’t think of anything more prominent than putting that disclaimer and the date of amendment on the front page of the report. Directly stating what had been corrected and why would help improve transparancy. Using a file name with a different date than the original would also be useful. Only very rarely can a TV documentary be seen as a pivotal moment in a major political debate, but such was Channel 4’s The Great Global Warming Swindle last Thursday. Never before has there been such a devastatingly authoritative account of how the hysteria over global warming has parted company with reality. With the aid of almost every top scientist in the field, from Professor Richard Lindzen, of MIT, and Roy Spencer, the former top climate expert at Nasa, to Patrick Moore, a co-founder of Greenpeace, Martin Durkin’s superbly professional film showed how the evidence is now overwhelming that the chief cause of climate change is not human activity but changes in radiation from the sun. Almost the only point he did not include was the evidence now accumulating from observers in many parts of the world that a significant degree of “warming” has recently been taking place all through our solar system, from dwindling ice fields on Mars, to Jupiter, and even as far out as Neptune’s moon Triton and Pluto. Yet it is at just this moment, when genuine scientists are at last hitting back against the hysteria, that our own political establishment, led by Tony Blair and David Cameron, is lining up with the EU, the UN and that self-promoting charlatan Al Gore. They propose measures that threaten not only to undermine the prosperity of the developed world but to rob billions of people across Africa and Asia of any chance to escape from the deprivation that kills millions every year. Truly, this pseudo-religious madness has become by far the most important and all-pervasive political issue of our time. Yup, I’m as speechless as you are. That’s how most government granted research works. Really, this is how the theory of global warming came about, through no-strings-attached kind of research. But The Telegraph has long had an incredibly anti-AGW, anti-environment agenda – not so long ago they gave 52 entire pages to the noon-scientist Christopher Monckton’s ill-informed diatribe, so I would have been surprised if they hadn’t had some coveraage of this sort. The onus and burden for instilling individual mentality, conclusion inferring, action or non action, belief, and a logical rational thinking process would not fall upon a climate scientist. Not unlike a physician, they provide information. What one chooses to do with that information (believe, seek out other opinions, conduct personal research, choose alternative treatment paths, become a non complaint patient, ect) is an individual action, reaction, and process. The crux of my statement in relation to the power of the people is most assuredly reflected in the executive, judicial, and legislative branches of our government which are responsible for enacting changes in current law or to remedy situations that constituents wish to be changed. Which I previously stated and point out in my prior posting. The EPA was sued by environmental groups/attorneys all the way to the Supreme Court regarding the responsibility of the EPA/government to regulate CO2. And certainly there are climate scientists who have testified for both sides. However, that too, would have nothing to do with politics regarding a climate scientist because he was requested by an attorney to testify as an “expert” for said attorney’s case. It’s a routine practice of the establishment to subpoena experts to testify on their behalf because the attorney feels that the testimony of the expert would support their litigation and arguments. Regardless, the arguments and stance offered within any case, is a reflection of the litigants, not the expert witnesses. More commonly, this is merely another form of mental compartmentalization, which most people practice in the medical or scientific fields, in order to function in their job capacities in order to operate without bias, preformed conclusions, speculations, and assumptions while carrying out their job functions. Furthermore, many scientific and medical employers prohibit the espousing and engagement of their employees in activities in conjunction with an employees status as their employee that would not reflect the feelings or standing of the said establishment and or employer. Glad to have provided some amusement in your day. Regarding the issue of temperature changes in glacial-interglacial transitions and CO2 time lags, keep a few things in mind: (1) the current rate of CO2 increase is some 30X higher than anything recorded in the ice cores, meaning that what took 1000 years in the past is happening in about 35 years now; (2) we are in the interglacial now, not coming out of a glacial period, so the comparison is of limited use in understanding the current situation (similar to trying to understand how changes in global ocean circulation will affect climate), and (3) the ‘solar issue’ is often poorly reported; the orbital solar forcing is the one that drives the ice ages, and that relies on the changes the distribution of sunlight on the surface of the Earth due to changes in the Earth’s orbit over thousands of years, not on changes in solar energy output. The fact that CO2 reliably tracks temperature and doesn’t vary randomly in the ice core records should be a clue that the two are closely related – and we also know that the increase in atmospheric CO2 is due to fossil fuels by looking at the carbon-14 content (nil in CO2 produced from ancient fossil fuel deposits). CH4 also tracks temperature with a similar time lag. This also explains why we come out of glacials at all – because the orbital forcing alone is far too low to account for the observed warming. By the way, note that when cows and other ruminants release methane, they are getting the carbon for the methane from grasses, which photosynthetically fixed the CO2 from the atmosphere (and the methane gets converted back to CO2 within a few decades in the atmosphere) – so it’s a different proposition from using buried fossil fuels for transportation. As far as the political and public relations issues, it seems a lot like the tobacco campaigns aimed at disconnecting lung cancer and cigarette smoke, rather than the ongoing attempts to prevent evolution from being taught in schools – the only way to slow global warming and associated climate change is to stop burning coal and oil, and instead rely on renewables for energy – and it’s a rather large economic disruption for the fossil fuel industry. The methods used are similar to those of the tobacco campaigns – for example, CO2science.org digs up local temperature records that show cooling and presents them as evidence that the planet isn’t warming – rather like digging up a 80-yr old ‘lifetime smoker’ without lung cancer and claiming that that proves there is no link between cancer and smoking. Incidentally (#60), much of the earlier work on climate, weather and the oceans was actually funded by the military, who wanted in-depth knowledge of the oceans, as well as information about how infrared was absorbed by the atmosphere. Some of the earliest evidence of global warming at the poles was collected by US submarines that measured the declining thickness of Artic sea ice. It’s also noting that most of the early work on global warming predates any concern about rapid climate change, but was simply aimed at understanding the glacial cycles and the behavior of the oceans and the atmosphere. From the comments and discussion, it also seems that the film avoided discussing the polar regions and the high-altitude glaciers, where the evidence is pretty incontrovertible that decades-old predictions of the effects of global warming are becoming reality. Since when you hit the download link you go to the latest edition of the report with the last revision date prominently on, I see no benefit. I think it’s a non-issue. If you think it is important, and you obviously do, then contact the IPCC about it. I’m sure they’ll be happy to receive your comment, and they may agree with you. Christopher Booker’s choice to defer to the views of such figures as Richard Lindzen and Roy Spencer is of course his prerogative. To refer to them as “…almost every top scientist in the field” is a fiction. So “puny man” was not responsible for punching a hole in the ozone layer by emitting CFCs (in the tiniest of quantities compared to the total mass of the atmosphere). Actually that is what we need. Global agreement to limit CO2 greenhouse gas emissions directly- just like the Montreal Protocol has done for CFCs. Interestingly, the models that predicted in the 1970’s that CFCs would deplete ozone did not predict that the hole would develop. It was the shock of the discovery of the hole in 1985 that spurred international action to control CFC emissions. The models had not taken into account the role of Polar Stratospheric Clouds. So- a point that the skeptics miss is that models can actually underestimate how bad things can get. Prior to 1985 there were many arguments posed against limiting CFCs- that parallel what we hear today about not doing anything about GHGs- “too expensive- no alternative technology- will damage the economy- etc etc. Do we ever learn from history? I hope that we do not need to wait for a “shock” re climate change before we get appropriate and binding global action to reduce GHG emissions. re 41 – cheers for those, Dave. Good sunday morning reading.It strikes me,as a non-scientist, that both sets of graphs are fairly meaningless unless we know whether the background cosmic radiation is a constant or not. Are there any hypotheses relating to this? Also, I’ve been looking at a couple of forums who take the opposite view to you guys. They cite that water vapour is a much more significant greenhouse gas than CO2. Could the current escalation in temperature have anything to do with the increase in atmospheric water vapour caused by the last 150 years of natural warming? It would seem to follow, at least to a layman like myself. re 42 – I hate to tell you, but you don’t get to decide when a question is open or not. Hindsight will be our ultimate judge. If there are people who oppose you, then the debate’s still open. It would be so convenient if it were otherwise. I come from an Arts background, and studied the philosophy of science whilst at Uni. If I remember correctly ALL scientific truths are, and should be, open to debate and eventual revision. I find the “we’ve decided, and so that’s the truth” attitude that I see on this board reasonably abhorrent. I have some respect for the peer review system, but I do not let this blind me to the fact that scientists are humans and will fall into camps, hold allegiances, play politics, and dismiss their opponents out-of-hand just like the rest of us. The peer review system is also compromised by the inconvenient truth that the majority of climate-research funding comes from bodies who are trying to prove a specific point. This is no “golden age” of research. Anyone who begs to differ will be, effectively, working themselves out of a job. People (and I include scientists in this generalisation)don’t tend to do this. I imagine that the cell-phone in my pocket, which gives my a mild headache after 20 minutes use, was proved to be safe for children by a series of peer-reviewed articles. re 44 – Thanks for likening me to a war criminal. Raised a chuckle on a dull sunday morning in Aberdeen. It strikes me that climate modelling is so tenuous that no court would ever entertain it as evidence. In general – Like I say, I’ve got an open mind. I sympathise with the pro-warming camp. You’re saving the planet. The glamour of that must be overwhelming. But what if you’re not? That also has to be considered. Like I said previously, humanity needs to clean up it’s act. Our squandering of resources is disgusting on a fundamental level,regardless of any apocalyptic consequences. This needs addressed, no question. Finally, please stop the Channel4-bashing. This is infantile, and smacks of pro-censorship. Channel 4 has a government mandate to produce challenging and controversial programming. It is obvious from this thread that it has sparked debate with this documentary. That can only be a good thing. It’s made me aware of some of the underlying issues that would otherwise have escaped me. This striving to “shoot the messenger” begs the question “what kind of world are you trying to save?”. One where the likes of myself get shown footage of random glaciers and hurricanes and are terrorized into doing our governments bidding, rightly or wrongly? Oh yeah, as a seasoned documentary watcher, I have to ask: how does the global-dimming thing fit into modern climate modelling? Just curious…..
Houghton is one of my heroes, not just because he has the climate science right, but because he was willing to e-mail me, a complete stranger, electronic versions of the tables from his book “The Physics of Atmospheres” (2002 version). He is a gentleman as well as a scientist. No. You are the only one. In fact, you may be the only one in the world. Lonely there at the top, isn’t it? That’s what the IPCC is all about. But the conclusions from there get called a fraud and a swindle by the denialists. Your mistake is in thinking that people want an unbiased review of the evidence. Most just want their own prejudices confirmed, and will ignore or denounce anything to the contrary. An individual man may be puny, six billion humans with an advanced industrial technology are not. We can, and must, urgently, do something to stop the increase in greenhouse gases that is heating up the world. 1. The graphs posed are only decent proof. Numbers can be manipulated, as made note of in the film. Their numbers must be regarded with skepticism. 2. The documentary’s filmmaker is very biased and misrepresents certain things, mostly the accreditations of the scientists. For example, one scientist labeled as the former head of the National Weather Center was really the former head to the National Satellite Weather Center. Furthermore, he used leading questions and was uncritical of weather data collected over hundreds or thousands of years using in my opinion, questionable methods. The only sound measurements we have are from statellites since the seventies. Everything else declines in quality. Nonetheless, this is not a huge criticism. After all, the film does not pretend to be balanced, unlike Michael Moore’s Bowling For Columbine. Its filmmaker is no more questionable than Al Gore from An Inconvenient Truth. So, why should we automatically discredit what a lot of scientists say, because the filmmaker is nutty? We seriously give Al Gore’s and Moore’s ideas consideration, and ignore the messenger. Thus, we should care more about the arguments and science given, and not the filmmaker. The only reasopn people are so critical is because this is a right wing documentary. Quite frankly, we need to be objective. Nonetheless, the film still has a lot to teach you. Furthermore, the arguments used against it from the press amount to ad hominems. Realclimate.org attempted a scientific refutation. Their slogan is “Climate science from climate scientists.” I will disprove their counter-arguments, not to show my brilliant understanding of the subject (I am not a climate scientist,) but the very poor understandings being peddled by “talented” scientists. “COULD in fact”??? Yet, this is the “correct interpretation”??? This makes NO sense. First, whatever made the world warm is STILL happening before the increase in CO2. Second, the most they can be claiming is that the world got warm naturally first for 800 years, and then the other 4200 years were caused by a new runaway CO2 warming. However, this is just guessing and does not explain why the CO2 would stop warming at year 5,001. What independent force stops the warming then? The fact is, they are coming up with seemingly logical excuses that do not hold up to even the most unintelligent (mine) scrutiny. “They cite that water vapour is a much more significant greenhouse gas than CO2. Could the current escalation in temperature have anything to do with the increase in atmospheric water vapour caused by the last 150 years of natural warming? It would seem to follow, at least to a layman like myself.” Dave. Dave, you’ve found realclimate, there is a good article about water vapour to be found right here. You might find that you have it backwards. Re 47, 55. Colin and Max, I make it a point to try to reach out to skeptics. If my extended hand is met with the back of yours, at least I am none the worse for it. First, to address Max’s complaint. Actually Max, humans have had a tremendous effect on the planet. Humans caused extinction of all the large animals on Madagascar and in Australia. They may have played a role in the advance of deserts like the Sahara through overgrazing. There is strong evidence that in addition to “global warming”, we also influenced climate by dumping aerosols into the atmosphere (this is what called the cooling that skeptics often trumpet as “proof” that scientists don’t know what they’re talking about). You need to remember that we are talking about 6 billion puny humans, not just a few. A carpenter ant in isolation looks harmless, too, but a few tens of thousands can take down your house. In a way, science works like markets–some buyers are willing to pay too much or too little, just as some sellers have unreasonable expectations. Ultimately, though a price is agreed and those willing to sell and buy can do so. It is the best method we’ve come up with to determine a “fair” price. Likewise, it is hard to look around you and argue that science doesn’t work. This is just science working normally. There is no more controversy over climate change within the scientific community than there is over evolution or relativity. It is just playing out under the spotlights and microscope of media attention. One expert can be wrong, as can two. However, when nearly ALL the EXPERTS–people who have studied a field for decades–agree, and you reach the opposite conclusion and are not an expert, then you have to consider the possibility that they understand the field of their expertise better than you do. Your “rebuttal” of the documentary seems very weak to me. You concentrate on the easier, more obvious points and ignore the more difficult ones. You don’t show any sense of uncertainty, despite the vast complexity of the matter in question. The reply to this documentary here and elsewhere has been 98% political above all. I consider myself a radical green, but not at the cost of rationality and free speech. The calls to censor these views are nonsense, compared to the much more wild and non-scientific stuff that has been printed in the name of raising GW awereness (a central green politician in my country even managed to mention the asian tsunami and GW in the same context). The role of the sun is the central question here I feel (not pretending to be a scientist). Because it offers a very logical and plausible explanation. “Even” the recent IPCC report admits that there is “10% possibility” man is not affecting the climate. And how do you really count it’s 8% or 17% or 24%. It either is, or isn’t. The figure is arbitrary, yet quoted over the world as some sort of statistical certainty. 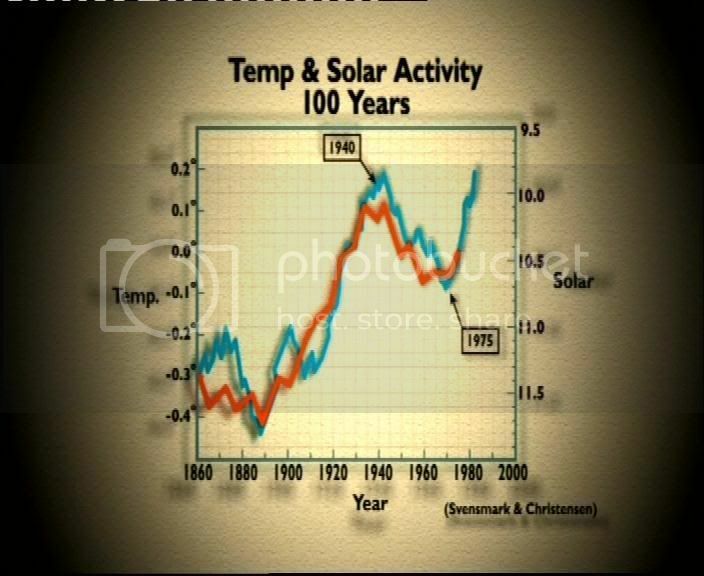 Also it is true that Global Warming “hysteria” started as a very strong and fastly growing political movement some 17-18 years ago, when there was only very little data to back-up the hypothesis. And we do know how much Greenpeace have utterly lied and spread misinformation about nuclear energy. Since then (the early 1990’s) government funding and man made GW being real have gone together, hand in hand. It is a very valid question to ask, whether this has affected the research. If there is no problem (or severe doubt whether a problem exists) then there will be less funds available, and unemployed climatologists out looking for jobs. Also censorship of disagreeing peer reviews in the IPCC report strikes me as something that is foreign to science and open minded thought. Your comments on that? The question about computer models being unpredictable, the role of water vapor etc. are also valid ones. And how much do we really know about cloud formation, cosmic rays etc.? All these things from sun to CO2, to whatever (because the world is very complex) should be somehow put together into one model. Now the models only can predict so much, or very little to be more exact. The AGW (and I’d agree with the pre-cautionary principle) agenda doesn’t come across as very scientific. Even reading the IPCC paper, it is true, you keep asking yourself “isn’t this an assumption, how have you proven this, aren’t these factors too complex to assess” etc. Yet.. the agenda is driven forward with 100% certainty and scientific disagreement is looked upon like it was some sort of environmental form of holocaust denial, while non of these scientists in the film are actually getting paid for it, they aren’t getting any grey corporate dollars like the greenpeace-minded lobby are claiming to. To the contrary it should be underlined, that these IPCC scientists do have a personal financial agenda to “prove” that no doubt or disagreement exists any longer on man made GW. The more central the agenda becomes, the more funds, more job opportunities, more recognition they will be getting. It would a career suicide for them to radically change the course, even if reasons for scientific doubts kept arising. You don’t have to mislead people, it’s enough to concentrate on certain aspects and keep feeding them into computer models that give the right answers. That’s what’s been happening partly. You don’t get a sense of overall picture from the IPCC reports. Water vapor, sun etc. uncertainty is wiped under the carpet. From a purely rational point of view, you should say the GW is a hypothesis, and one that is extremely hard to verify or substantiate. At the same time playing Russian roulette isn’t wise, that much is true. Yet there is too much religious approach to this question, too much political agenda. Personally I don’t trust anyone who claims to speak for the truth. Science should be about constant research, doubt, self-criticism. I have seen very little of that on this website, or other scientific (or portraying to be such) AGW websites. Science seeks answers. Here it is the other way around. The answer has been “self-evident” from the beginning, even when there was next to no data to back it up. An answer that cannot be valsified, only verified. In any case time will tell, because China, India, Indonesia, Brazil etc. are growing at a speed that will make EU and USA a small player in the Global AGW battle. Today 30% of Global CO2 emissions. In 2023 it could be 14% (USA+EU combined that is). The man made GW conviction is bordering on religious, that much is true from the critics. Not driven by pure science, but political motivation above all and you should come out clear on it (that there is the anti-west angle, despite west in todays world attributing only to 1/3 of the global total). Don’t cloud the pre-cautionary principle into a cloud of scientific assumptions, that remain just that in the larger picture, a hypothesis. Good point – I just want an unbiased view from the people that understand these things better than me and then we can direct funds into resolving the problem, if indeed there is a problem that can be resolved. Are you serious? So why is eveybody doing research into Man Made Global Warming and not just Global Warming or is this something else I don’t understand? I am genuinely interested and open minded enough to be converted to the MMGW camp. Comment 75: Thanks Ray, I think that was a good answer, and I do accept that people know more than I do, especially those who are experts in their field, however, you must remember that eugenics, abhorrent as it is, was an academic discipline at many colleges and universities prior to the 1930’s and had many prominent advocates. Could you or anybody else explain the following taken from the National Geographics web site? “Earth is currently experiencing rapid warming, which the vast majority of climate scientists says is due to humans pumping huge amounts of greenhouse gases into the atmosphere. I know this work has been dismissed by many climate scientists, but I don’t understand why. The science of GW actually goes back to the 19th Century. So the programme was also wrong about Mrs Thatcher being responsible for beginning the awareness of GW in recent history. The labels ‘1940’ and ‘1975’ are nowhere near where they should be. A ‘little ‘artistic licence’ perhaps? – B****cks – this is out and out deception in a programme which accused the entire scientific community of lying about global warming. A scientist that did this would be disowned by his colleagues – and never trusted again. 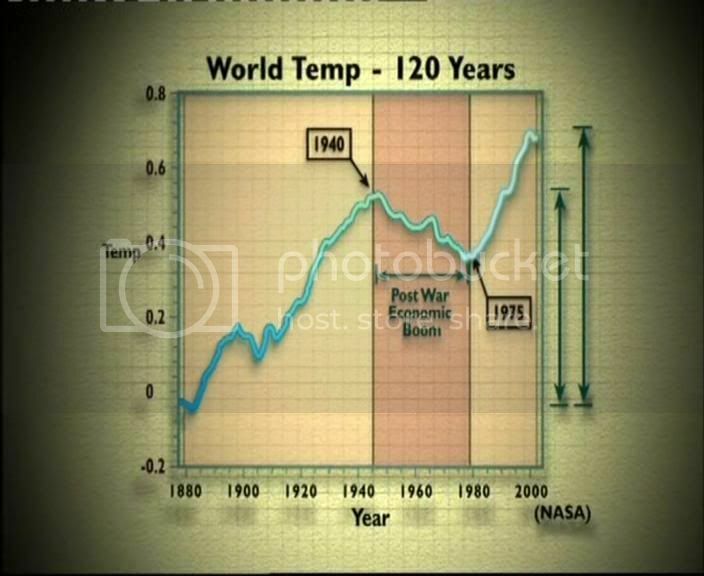 Before CH4 come up with their ‘interesting polemic’ and ‘presenting both sides of an argument’ and ‘controversy amongst scientists’ (shrug of the shoulders) defences – could I point out that holocaust deniers use exactly the same fraudulent graphs to make a case for their interesting ideas. So when does David Irving and his chums get 90 minutes to present their case unchallenged?? This article was taken from Mr. Monbiot’s Blog. It gives a lot of background and explains how this program came about. By George Monbiot. Published in the Guardian 18th December 1997. There has never been a series on British television like Channel 4’s Against Nature, which ended with a debate on Tuesday night. The environmentalists it interviewed were lied to about the contents of the programmes. They were given no chance to respond to the accusations the series made. They were misrepresentated to the extent of falsification. One couldnâ��t help suspecting that Against Nature was driven not by healthy scepticism but by shrill ideology. If this were so, where might it have come from? At first we thought the Far Right might have been involved. But, over the last three weeks, another picture has begun to form. Against Nature IS the product of an extreme political ideology, but it comes from a rather different quarter: an obscure and cranky sect called the Revolutionary Communist Party. Frank Furedi, the series’ key interviewee and a protagonist in Tuesday’s debate, has been described as the father of the modern RCP. He is a regular contributer to the RCP’s journal, Living Marxism. Of the two main contributers to the third programme, one, John Gillott, is Living Marxism’s science correspondent. The other, Robert Plomin, though not RCP, has recently been interviewed sympathetically by the magazine. Martin Durkin, the director of the three programmes, describes himself as a Marxist: the only brand of Marxism which follows the line the series takes is the RCP’s. The husband of his deputy, Against Nature’s assistant producer, is the co-author of the RCP’s manifesto and Books Editor of Living Marxism. Line by line, point by point, Against Nature follows the agenda laid down by the RCP. Greens, both the series and Living Marxism maintain, present themselves as radicals, but are really doom-mongering imperialists, engaged in the deification of Nature and the rejection of human progress. Global warming is nothing to worry about, while sustainable development is a conspiracy against people. Greens have plotted with the film industry to make science terrifying. Genetic engineering and human cloning are not to be feared but cherished, as they will liberate humanity from nature. The ideologues in the series have some strange bedfellows, but the RCP has always been good at making selective alliances, whether it is promoting anti-environmental ideas, or campaigning against a ban on landmines and in favour of the Bosnian Serb forces and the Hutu militias. Its members are controversialists, but more than just that: the principle targets for their attacks are alternative outlets for radical action. I had scarcely broached this subject on Tuesday night’s debate when Martin Durkin began – and I do not exaggerate – screaming. I was a McCarthyite and a despicable conspiracist. What on earth did his personal political views have to do with this series? Well, rather too much. The RCP and its associates can make as many programmes as they like as long as they do so openly and honestly. Indeed, among its perversities and cheap controversialism, the RCP has some interesting and provocative views, which are worth hearing and debating. But Martin Durkin and his commissioning editor, Sara Ramsden, maintain that Against Nature is not a polemic, but a well-balanced documentary series. There was no presenter; instead we were instructed, in true documentary style, by an authoritative voice-over. The RCP/Living Marxism interviewees were not captioned as such, but presented as independent experts. Obviously the Brits too have their deniers. Every country does: my own country Australia certainly does. We have been held hostage by a backward conservative administration that has only changed its rhetoric because it has detected a groundswell of popular acceptance with an election coming up. One significant problem with the 800 year time lag and the comments that increasing CO2 then provided the feed-back to fully lift the world out of the ice ages is that the increase in CO2 is so small. CO2 increased by only 100 ppm over the period of 5,00 years as the ice ages started to end. This is far too small to provide the warming feed-back that is proposed. In fact, CO2 has increased by a further 100 ppm in the last century and we have not seen anything like the temperature increases which ended the ice ages. The Antarctic warmed by over 10C as the last 4 ice ages ended. CO2 increased by 100 ppm (with a very long lag-time of course.) No model or global warming theory I have seen can explain that discrepancy. Another question? what is the time-lag for increased CO2 to warm the surface. Since CO2 is absorbing EM radiation (photons in the IR frequency), shouldn’t global warming be near instantaneous (operating at the speed of light.) Certainly there is not a time-lag of 800 years or even 10s of years. “Applying their analytical method to the solar output estimates by the Columbia group, Scafetta’s and West’s paper concludes that “the sun may have minimally contributed about 10 to 30 percent of the 1980-2002 global surface warming. This study does not discount that human-linked greenhouse gases contribute to global warming, they stressed. “Those gases would still give a contribution, but not so strong as was thought,” Scafetta said. Is it any wonder that people like me are confused by the whole debate over whether man is to blame or can do anything to control the climate? Gavin, your responses detract from your original propositions. Essentially, all 3 of your counter-arguments are that “no one factor contributes to global warming.” This is very true and I agree with that. However, that is precisely the problem with the man-made global warming proposition: that largely one factor can be isolated and attributed to global warming. Your responses, though logical, do not really denounce the points made by an unscientific documentary with scientific claims. Regardless of your issues with UAH’s dataset, you still ignore that the study you sight to “prove” that trophospheric warming is “indeed” greater than surface warming says in plain English the complete opposite. I am more than happy to admit that the documentary has its flaws. But, you and others here have to admit that your counter-arguments to the documentary are flawed as well…sometimes blatantly such as in the above example. If this whole issue was more science and less ideological bickering, I think we would see more level-headed and balanced responses from both sides. This is not something I see, but not being a scientist (while those on this espouse of being such), it is pretty concerning that you cannot even link to articles that agree with you or your own articles that definitively in theory show that the 800 gap is from a clear cause. I believe the writers of this article should issue a retraction, admit their mistakes, and issue a valid response or not at all. The 3 points above, as the main ones taken to deswindle the swindlers, are shoddy at best and poor at worst. Where you can see that amongst other things they’ve greatly exaggerated pre 1940 warming to play down the dramatic recent warming. The reason why most climate research these days is looking at greenhouse gases and anthropogenic causation is mainly because there is simply no other credible hypothesis. We can and do measure solar radiation. We measure galactic cosmic rays (guess what–no change in the past 30 years aside from what’s expected from the solar cycle). And so on. As Sherlock Holmes said, “When you eliminate everything that is impossible, whatever is left, no matter how seemingly improbable must be the answer.” That’s anthropogenic greenhouse gas emissions. Also, while most of the current research is looking at this cause, it is by no means the only research going on. The quickest way for a scientist to get famous is by discovering something his or her colleagues haven’t thought of. Lindzen and Svensmark think they have done so, but they have yet to produce sufficient evidence (any, really) to persuade experts that they are right. Re 77. Hopp, you seem to have a few misconceptions about climate research. First, the 90% “probability” that humans are contributing to climate change is probably more of a Bayesian probability–a conservative estimate that the vast majority of experts could agree on. You might also look at it as a confidence level–in other words there’s only a 10% probability that the results could line up the way they have by chance or via some other mechanism. For Earth sciences, this is high confidence indeed. The most serious misconception, though, is the idea that climate scientists have a dog in this fight–they don’t. If anthropogenic climate change were disproved tomorrow, they would be doing research on something else. Even those who did not find jobs in climate research would find jobs doing models for hedge funds or something else more remunerative than climate research. The people who do this research do it because they think it is important. They see that changing climate represents a variety of threats to modern human civilization, and they want to do something about it. To impugn their integrity by implying that their puny salaries could buy their scientific opinion is not just flat wrong, hell, not even just laughable, it is insulting. Since you, yourself, are not a scientist, and since virtually ALL the experts have concluded that climate change is occurring and that we are responsible for it, don’t you think that you ought to consider the possibility that they, with their decades of research and study, might understand it better than you? For those that might be interested, I’ve made an image showing the graph from the programme, overlaid with the NASA GISS temperature data (black and red lines). Can anyone help me? I’ve read this from RC which explains the mainstream explanation for the CO2 rise lagging T.
Q1: If there is a feedback mechanism, what stops it accelerating exponentially? Q2. Is the mechanism by which T initially starts to rise still not understood? Volkswagon, Hastings & Direct, Bradford & Bingley, Visa, Yakurt, Orange, Audi, Virgin Media, Mitchelin, Zurich finance, Wrigley (orbit gum), Ing Direct (finance), Magners Cider, confused.com (insurance), Christian Dior (J’adore), Kraft foods (Toblerone, Cote d’or), Nat West, Love Films, Citreon, Nissan, Expedia, Microsoft, Ibuleve, Otex ear drops. Please don’t be too hard on C4. I’m here reading your fascinating comments as a direct result of watching “it”. I want to be sceptic about AGW but I accept rigorous science. It seems to me that to be safe we must act to do the least harm and most benefit. Holding back emerging economies from developing would certainly condemn another generation to grinding poverty and early death. It might be easier for us to adapt to a warmer climate than explain ourselves to the developing world if dT turns negative for the next 30 years. Can anyone point me to work done on plant carbon fixing as a result of an extended growing season in northern land masses? You simplify the issue. It’s not insulting at all. There are many scientists out there looking for jobs, who would love to have this level of funding the climatologists enjoy. I’m not doubting their sincerity. But the fact is the political truth existed before the scientific consensus. And 90% and 10% is nothing really, the numbers are arbitrary. Correct me if I remember wrong, but in the previous IPCC report (not the latest one) it was estimated that the earth would warm 1.4C-5.8C if nothing was done to curbe the CO2 emissions. I mean 1.4C-5.8C, what is that? Why not 1.3C or 6.1C? How do you count it with so many different factors from solar activity to cloud formation, to water vapor, to CO2 emissions etc. No one scientist can really handle the issues of GW in one single piece. No one can claim to have such expertise. Everyone is relaying on others, and trusting their authority. It’s like a puzzle that is placed together, with many of the parts missing and then it’s run through man made computer models, that naturally cannot even come close to matching the complexity of the climate. You have your answers ready made. One example. gavin here (if I remember correctly) linked to an article that was supposed to disprove the cosmic rays factor, but all the article was to distort the words of the Nordic scientist, compare him to some guy from 1850’s (personal attacks again), and then what he really had in store to debunk the cosmic ray theory was that, well… we don’t know enough about it yet. Even Einstein held faith in his special theory in face of growing evidence. As long as AGW remains unproven one way or the other, and we have to rely on suggestive evidence, conclusions and models, healthy skepticism should be encouraged. And this would be the case in any other scientific question (with the possible exceptions of GM and such – for similar reasons). Every single time some dears to criticize AGM he is attacked in person, he recieves hate mail, threats and abuse and is – often wrongly – accused of ties to oil/coal companies. That’s not how science works. That’s politics. Regarding the comments about ‘puny humans’, one might as well talk about ‘puny ants’ or ‘puny elephants’, both of which also have large effects on their local environments, or ‘puny phytoplankton’. What’s strange is how political advocacy groups like AEI, CO2science.org, etc. immediately sieze on any such discussion of human effects as evidence that ‘humans are viewed as a cancer on the Earth by these wild-eyed environmentalist crazies’. Really, the point (as far as global warming goes) is that we need to stop pumping buried carbon into the atmosphere, and that means ending the use of coal and oil as energy sources and replacing them with renewable energy conversion and storage technologies – it’s really very simple. However, since the global economy revolves around energy sales, this means serious change – and if you own an oil well, or three, then obviously you are going to have a strong emotional response to anyone who tells you that you can no longer pump and sell oil. The best analogy of our current energy system is that of a small village that discovered ancient ruins filled with buried loot – the villagers began digging up and selling the treasure, and as a result grew into a large city – but eventually they are going to run out of buried loot, and digging it all up has fouled their rivers and their air – so they are in a quandry, and need to make major changes in their basic economic strategy. Vested interests are resistant to change, however, and so they hire public relations experts to prevent change from occuring, and they finance movies, books, and web sites to get their ‘message’ out. It’s an understandable response, but is very foolish in the long run. A lot of “skeptics” like to talk about water vapor but never mention the fact that combustion of a carbon/hydrogen based fuel releases both CO2 and H2O as vapor. In fact, it is the only process of which I can think that can allow an addition to the absolute amount of water on the planet, except for objects coming from space. Considering the vast amounts of fuel burned it should be sizable. I expect that this vapor will have simply the short atmospheric life span of all water vapor and simply join natural vapor in its cycle, but what role could the absolute increase of global water content play, if any? Has this been considered in any way? Never confuse an open mind with a vacant one. And there are people with personal agendas who prowl continually to ensnare the vacant minded. which is a good advice for anyone entertaining discoursing on any topic herein where you draw comment from professional scientists whose day jobs are climatology and atmospheric physics. Those professional scientists have open minds and can see more of the picture than the merely open-minded (or vacant-minded) scientific dilettante. More humility, less hubris (little chance, I fear). And you are saying that ALL the facts are in and have been given due consideration?